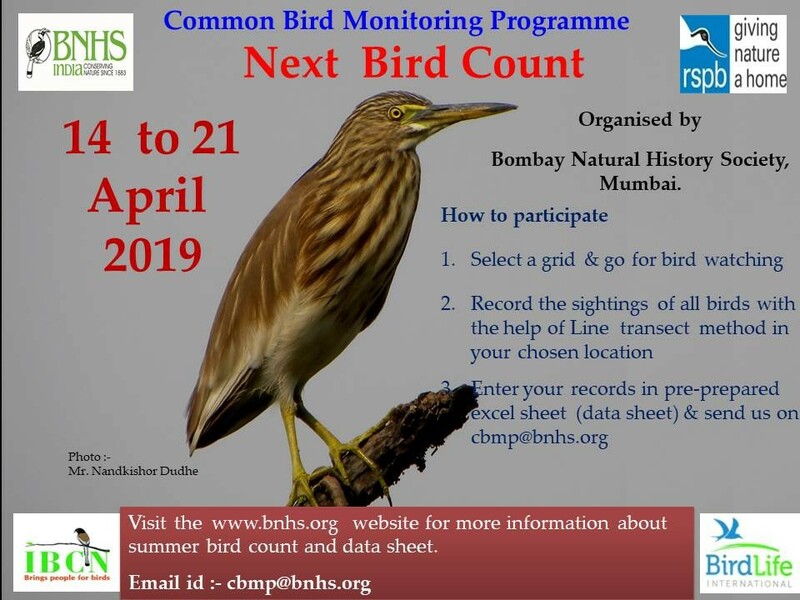 Bombay Natural History Society (BNHS) has announced its bird count for the summer season from 14 to 21 April 2019 under its Common Bird Monitoring Programme. BNHS invites bird watchers, NGOs, ornithologists, and nature lovers to participate. The counts will be conducted across three seasons on a pan-India level. This programme is completely based on scientific methodology, the data which will be generated with the help of Line Transect methods, will be useful for conservation of our neighbourhood species. Kindly choose the preferable date in the given week and contribute your valuable time to count our common birds. Common Bird Monitoring Programme is a citizen science programme. The objective is to involve more and more people in observing birds in their own backyard or a location they visit regularly. There are several existing good initiatives where people can record their bird sightings. However, there is a need to accurately monitor trends in common bird populations. Hence, we have started this unique activity in India namely Common Bird Monitoring Programme (CBMP). To provide information on year-to-year and longer-term changes in population levels for a wide range of birds across a variety of habitats throughout India. To understand the extent to which bird populations are increasing or decreasing. Monitoring birds is crucial as they act as indicators of a region’s/habitat’s health. To promote a greater understanding of the population biology of birds and, in particular, to focus on factors responsible for the declines. To function as a key component of BirdLife’s monitoring strategy. To promote bird conservation through the involvement of a large number of volunteer observers in survey work. To observe and report the birds using a scientific methodology so as to get more authentic data. To collect the data, ideally three times a year, so that in the long run we can get information about the changes in common bird populations. Why we count Common Birds? Common birds are in trouble owing to urbanisation, industrialisation and other anthropogenic activities. For example, the population of House Sparrows is considered to be declining in the cities. Anthropogenic pressures in the form of concretisation and other developmental activities disturb many bird species living in an area. To know their current status, it is necessary to monitor these common species. We have plotted grids on the map of India with the help of GIS software. We need your location details (Google earth coordinates), and based on this, we shall send you a grid (which is in close proximity to your location). If performing the Line-transect in the selected grid is not possible due to geographical limitations/obstructions please write about it to us and we will send a new grid. Each grid is 2*2 km, and each participant will be sent a grid, in which they must perform the survey. Those who have already selected the grid, they can perform line transect method on the same grid. It is very important not to reject sites that may appear uninteresting. Grids containing a few species are just as valuable as the ones with many species. This method is practical and efficient. Line transect method is based on the theory of walking along a predetermined route at a fixed pace (speed) to record the birds on or near the line. With the help of these methods, you can observe the birds and note down the observations in the provided data sheet format. This summer the survey should be conducted the visit between 14 to 21 April 2019 (choose one day).Counts should ideally start around 7a.m. and no later than 9a.m (2hours). Counts will be more productive early in the morning; birds generally grow quiet and inactive during the middle of the day. Surveys must not be carried out in conditions of heavy rain, poor visibility or strong wind. Birds generally become inactive in windy and wet conditions.Please record weather conditions in the boxes provided on the forms that describe cloud cover, rain, wind speed, and visibility. Choose one number (1-3) from each of the four headings below and enter these in the box provided. If the weather conditions change during your urvey visit, please select a single weather category that best represents the overall conditions. Counts should ideally start around 7am, and no later than 9am. Please try to keep the starting times similar within and across years. Please also try to keep visit dates similar across the years. Counts will be more productive in the morning, with birds generally becoming quiet and inactive during the middle of the day. Record all birds to the sides of your transect line. Record all birds from your transect line that you can see or hear that are to the sides of your transect line, even if they are distant. Ensure that only the number of birds recorded is written in each box on the count summary forms. Additional information such as ‘+’ or ‘many’ complicates the forms and should be avoided. The previous data sheet has been updated so please kindly download the new datasheet attached and use that during the count. Bird species names are recorded on the Field Recording Sheet in the order in which you observe them. From your chosen starting point walk the transect route at a slow and methodical pace,pausing briefly to listen for bird songs and scan for birds flying overhead. Please note the starting and finishing times of each transect (using a 24-hour clock, e.g. 0730 for 7:30am, 1300 for 1pm). As a guide, an average visit should last around 2 hours. Record all the birds you see and hear on the Data Sheet. Please complete the summary sheets (one for each transects) as soon as possible after each field visit and preferably on the same day. The form summaries the information so that it can be analyzed. The Count Summary Sheet includes the names of species that aremost commonly encountered in most habitats in India. At the end of the count summary sheet you may use your more general local knowledge of the site and/or area to provide information on any potential threats(both current or future) to the habitat and/or birds around your transect. This simple, but essential information will allow us to assess how the site is doing, what problems (if any) affect it and what is, or can be done to tackle the problems. If you are able and wish toprovide additional information, please contact at the given address. It is pre-prepared excel sheet containing a comprehensive list of bird species commonly encountered in and around your location. The data collected in the field and noted on the data sheet must be entered onto the count summary excel sheet and sent to us (do not edit the data sheet; you have to just enter the number). If you have recorded a species which is not present in given excel sheet then you have to add the species name at the bottom of list. All the species names are arranged alphabetical order which is easy to search the species. Participants can enter the data onto the count summary excel sheet and send it via email (cbmp@bnhs.org).Once we have received your completed, filled data sheets for all three seasons (monsoon, winter and summer), you will receive an certificate/acknowledgement letter from the Bombay Natural History Society. You have to fill the given excel sheet (do not edit any species name, new species name add at the bottom of the list), you have to just add the individual number of species. Avoid sending word file, photograph of checklist. The data should reach back to us within a month after the survey. Please specify the number of individuals you encountered in each grid during the survey. Do not use tick or any other symbol to record the sighting. Please fill all the details required about the survey such as (Name of observer/(s), Area, District, state, Grid no., Habitat, time required, Date, etc.). During conducting the survey make safety your first priority use personal protective equipment’s. Many thanks for helping with this important project and enjoy your counting!